If you want a short, easy – even family-friendly hike that rewards with incredible mountain scenery and a turquoise-coloured lake, look no further than the hike to Lake Oesa from Lake O’Hara in Yoho National Park. 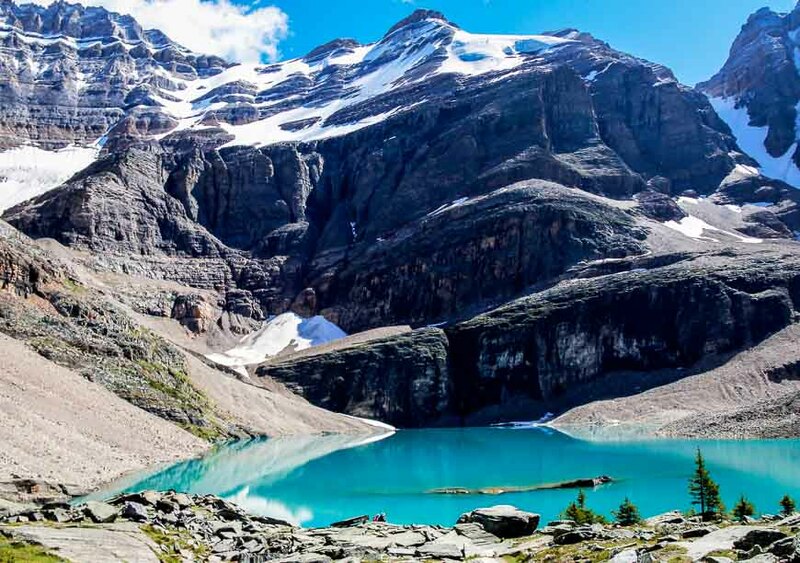 It’s a straight forward 6.6 kilometre (4.1 mile) round trip hike with only 240 metres of elevation gain – providing of course you start at Lake O’Hara and you haven’t had to walk in from the parking lot. But that’s another story. The crux of the Lake Oesa hike is getting there. Here’s what you have to do if you want to hike to the lake or on any of the other outstanding trails around Lake O’Hara. The trail to Lake Oesa is very well signed. And the trail itself is beautifully constructed. In places, huge slabs of flat rock have been carefully laid to provide a fantastic surface for walking on. Despite it being one of those most beautiful hikes in the Rockies, you won’t find throngs of tourists. When you finish the hike pick up cold drinks, ice cream bars and other snack food items at a small concession where by the bus stop. Bring cash. 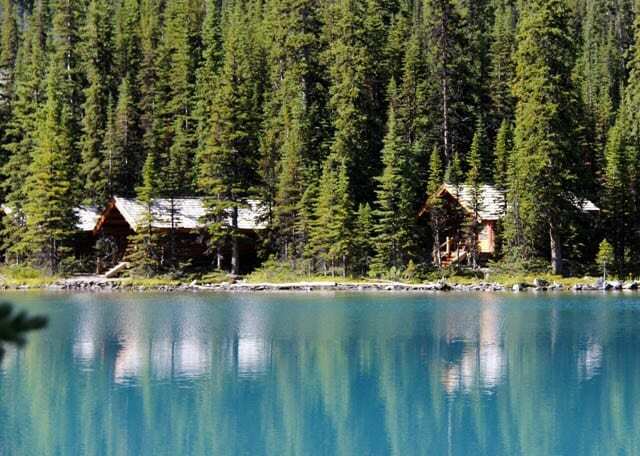 If you have the money – and that’s only part of the equation – then try and snag a room or cabin at Lake O’Hara Lodge. It’s best if you’re very flexible. Request a booking six months out or phone them for a last minute cancellation. Book a bunk at the Elizabeth Parker Hut. You are encouraged to apply by lottery beginning at the end of October for the following summer. In mid-December bookings that haven’t been confirmed are available on a first come first served basis. Get on the phone the second they’re open! Try to get a campsite. You can book these 90 days out beginning at 8 AM on April 1st by calling 1-250-343-6433. A friend and I tried for 30 minutes on two different occasions last spring and never got through. Try for mid-week or for some time in September when it might be a little less busy. You can stay a maximum of three nights. Only one tent per campsite is permitted and you can book no more than two sites. The 30 campground sites are usually fully booked by 10 a.m. MDT on the first day that reservations are accepted, three months ahead of your first night’s stay. All times are listed in Mountain Daylight Time; the same time as Calgary, Alberta and Golden, B.C. Your other alternative for a day hike is to try to book a seat on the bus. The first one leaves at 8:30 AM. Otherwise it’s a 12 kilometre walk up the road so hiking Lake Oesa becomes a little less easy. The round-trip fare for a bus trip is $14.70 for adult. If you’re just taking the bus out it’s $9.75 per adult. You’ve outdone yourself with the pictures this time Leigh. Beautiful shots of an obviously gorgeous location. Even seems like an easy enough hike for those of us who get tired on the first flight of stairs. Beautiful! The rewards seem to far outweigh the effort. I’m kicking myself for not exploring Yoho more when I lived in Calgary. @Laurel You’ll just have to bring that husband of yours back with you and do some Yoho hiking one summer soon. There are plenty of people from BC & Alberta that haven’t seen the east yet either. It may not be as glamorous but I do recommend a trip sooner rather than later to explore BC. And it’s so much more than just Victoria and Vancouver. @Steve You could do this one and love it. Your whole family would enjoy the scenery and lunch by the lake. We did this hike in August 2018. Lake Oesa is one of the most beautiful places on Earth. We did the loop around the Yukness ledge back down. The altitude is no joke. The gain in altitude was very tiring. Oh and those aren’t obese chipminks, they are golden mantled ground squirrels! @Trinity Thanks for the update on the chipmunks. Agree -it’s an incredibly beautiful hike.